The fourth annual State High School Wrestling Tournament will begin today with weigh-ins at[more] 10 a.m., at the University of Arkansas-Little Rock. Opening ceremonies will be held at 1 p.m., with matches beginning immediately afterwards. Another session will be held on Saturday starting at 9 a.m. Championship matches will begin at 3:30 p.m. The Bryant Hornets will be among those competing. 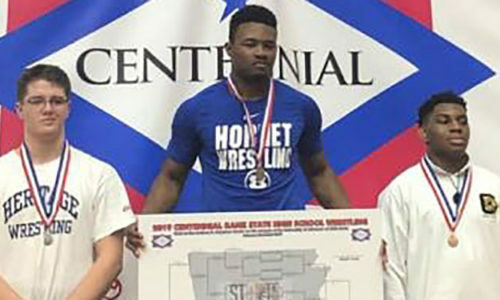 The Hornets recently finished fifth as a team in their conference tournament with defending State champion O’Dell Lee and Levi Brady winning league honors in the 195- and 170-pound weight classes, respectively. Brandon Powell (at 120 pounds) and Brett Blend (at 145) were runners-up in their classes. In addition, Zach Simmons (132) and Connor Goshien (160) each finished fourth. The Hornets finished behind Little Rock Central, Cabot, Little Rock Catholic and Conway. “We look forward to fixing our mistakes and having a better showing this weekend at the State Tournament,” commented Hornets coach Elliott Jacobs.